Theme Week: "Are You My Mummy?" It's time for another good ol' tried-and-true theme week. Five days, five reviews. 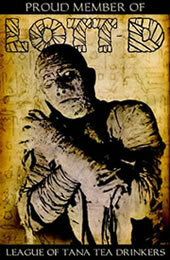 This time around, we tackle the ancient Egyptian (and occasionally Mayan) menace, the mummy. Swathed in bandages, he roams the desert (or countryside or swamp or whatever) killing anyone who disturbs his tomb (or steals his treasure or absconds with his beloved princess or uses the phrase "Do the needful"). Tuesday, July 1st: The Mummy's Tomb (1942) plus bonus Lon Chaney Jr. Masters bio.